Over 260 species of butterfly have been recorded in Hong Kong. The average number of species over surface area in Hong Kong is at the top level in the world. 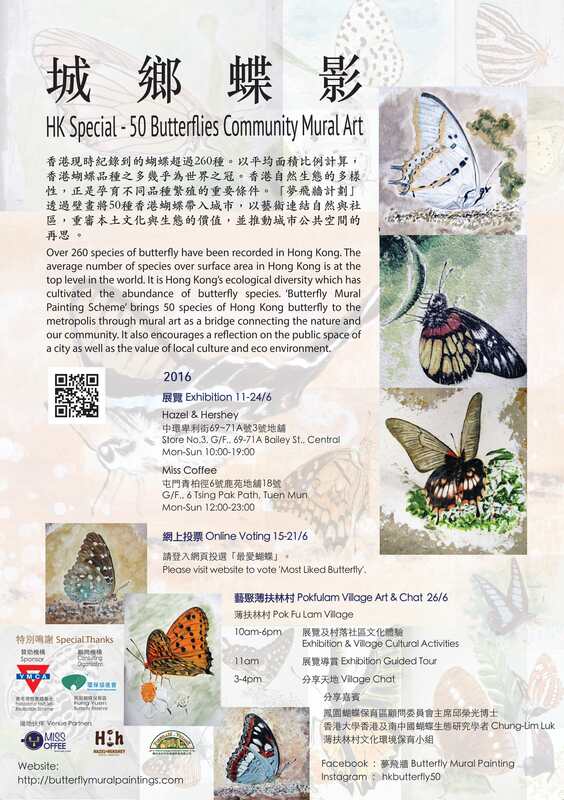 It is Hong Kong’s ecological diversity which has cultivated the abundance of butterfly species.‘Butterfly Mural Painting Scheme’ brings 50 species of Hong Kong butterfly to the metropolis through mural art as a bridge connecting the nature and our community. It also encourages a reflection on the public space of a city as well as the value of local culture and eco environment. In the past year, Butterfly Mural Painting Scheme has the honour to cooperate with 50 units which represent HK culture, spirit and value, including old stores, book houses, cafes, cultural stores, schools and old houses etc. Thank you very much for their selfless support providing their wall for butterfly mural painting. It definitely contributes to arise the awareness of people to protect our valuable cultural and natural environment. The scheme penetrates into corners of the community which encourages the public to approach community art and think about the various possibilities of public space. The coming exhibition will showcase butterfly mural paintings printed on canvas. It will be presented at two cafes and finally all 50 butterflies will fly to Pok Fu Lam Village. Hope people can experience the special community space, review the relationship between nature and human society, and explore the stories of life, dream and cultural heritage. Please visit website to vote ‘Most Liked Butterfly’ during the period above. © 2015, Butterfly Mural Painting Scheme of Hong Kong, All rights reserved.